Smith and Nephew Solosite Hydrogel Wound Gel Dressing from HealthyKin.com creates and maintains an optimal moist wound environment as it desloughs and debrides. Unlike gels formulated with water miscible polymers, SoloSite's water "swellable" polymer remains gel-like until saturated, so it stays in the wound longer and requires fewer dressing changes. SoloSite has been proven non-cytotoxic, non-irritating and non-sensitizing (Data on File). Its crystal-clear, physically stable formula doesn't change color, enabling an unimpeded view of the wound. SoloSite Gel gently rehydrates sloughy and necrotic tissue which must be removed before healing can progress. 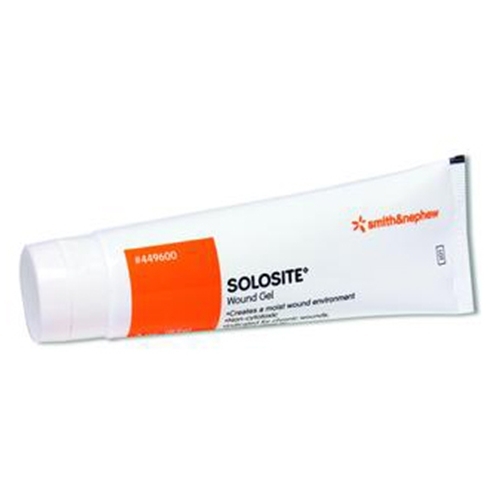 SoloSite also absorbs excess exudate, thereby halting the build-up of cellular derbris and so helping to prevent slough formation. SoloSite Gel is easily applied and removed, with gentle irrigation being all that is required for removal. SoloSite Gel provides a moist environment at the wound surface, preventing eschar formation and promoting fast, painless and problem free healing. SoloSite Gel contains effective preservatives to ensure that multiple reuse of the spray pack or tube may occur without fear of increasing the risk of wound infection. SoloSite Gel offers unequalled cost-effectiveness with its multi-dose presentation, whilst significantly reducing the potential for wastage. Helps with difficult wounds that take a long time to heal. Recommended by Wound Care Doctor and Plastic Surgeon. Wonderful product and Smith and Nephew are right on the "spot" at the charge for the product and getting it sent immediately! Very pleased! Very satisfied customer. Much less expensive than Hydrogel, and service more efficient than Walgreens.